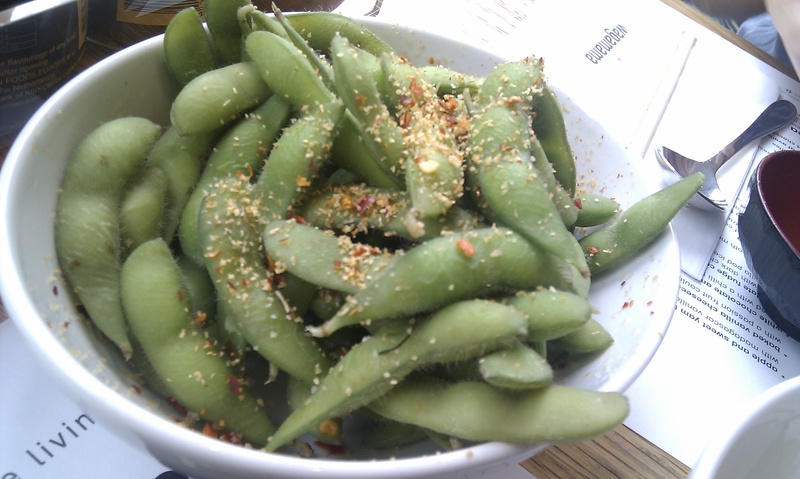 Miso soup, with Japanese pickles on the side, £1.40, and edamame beans with chilli salt as starters, £3.70. red chillies, coriander and lime. £10.15. a ginger tamarind sauce, served on baby spinach and dressed with wagamama house dressing, garnished with chillies with a small portion of rice. £9.15. Dessert was a dark chocolate fudge brownie cake with chocolate wasabi sauce served with vanilla bean ice cream. The food was fragrant and varied and delicious. As a chain restaurant it does brilliantly at serving food that tastes fresh and healthy, to an extent, but it does vary in its interchangeable university student led service. One meal was spent with batting away the various waiters who tried to take our unfinished ebi gyoza plate three times. We’ve had casual and rude waiters, indifferent and invisible others. On Saturday the person who waited on us was considerate and thoughtful and added to the pleasure of the visit. We managed to get a table by the window and this helps cut down the noise from the deep restaurant which potentially fits 128 people. The noise can become quite overwhelming the deeper in the room you sit. I visited three restaurants with an oriental / Chinese theme, Cathay Rendezvous and Zen that weekend. 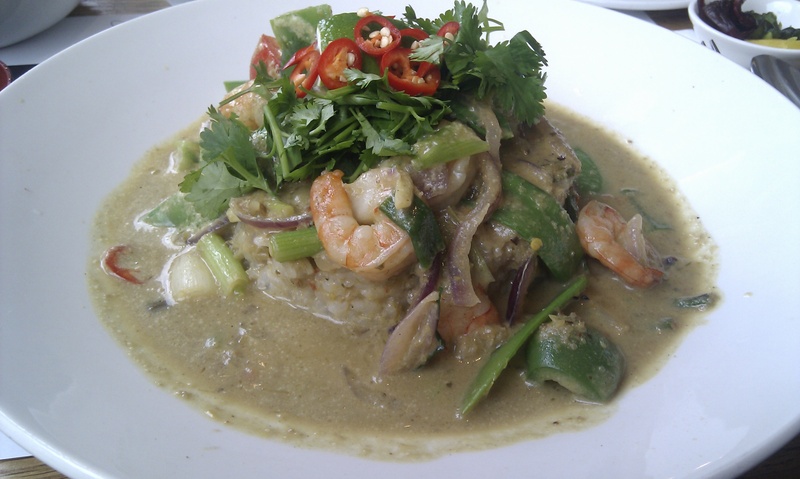 Cathay was average, Zen is a favourite but Wagamamas turned out to be the most fun meal with lots of variety. We were even tempted to go back the next day but it wouldn’t have been the same. 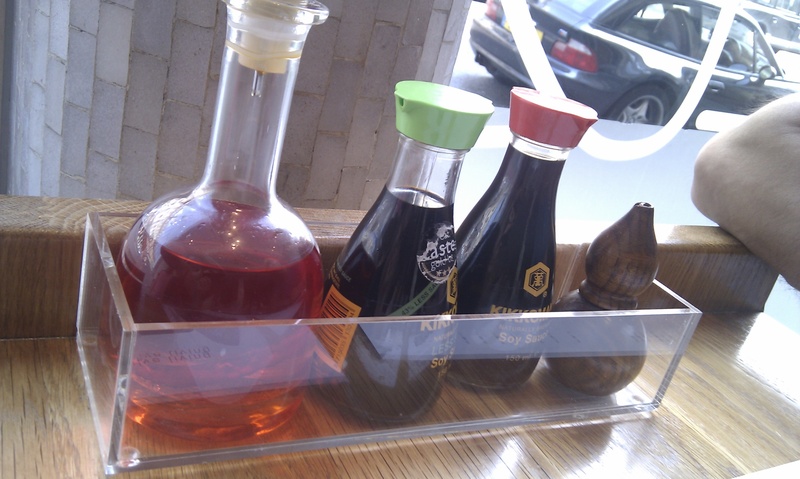 This entry was posted in Bristol, Food, Restaurants and tagged Bristol, Bristol restaurants, Food, Wagamamas. Bookmark the permalink.